Today's photo-of-the-day is from Cartagena, Columbia. Does it look like this city is prepared for the already present effects of climate change, to say nothing of the future? And this is a city that isn't in denial. But, despite the gleaming high-rise condos, on the whole it is a poor city. Plan 4C estimates the cost of adapting Cartagena to coming climate change challenges to be around $500 million. 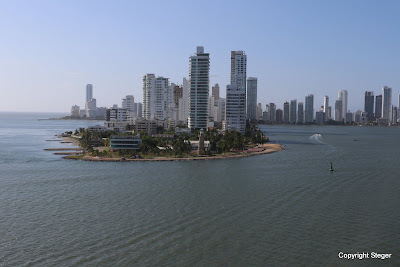 It calls for the 100 hectares of the walled old city of Cartagena – declared a World Heritage Site by UNESCO in 1984 – to be kept at least 200 meters from the sea. As sea level rises, this will require a system of dams, dikes and breakwaters. Without those, up to 86 percent of historic Cartagena – including much of the old city – will be invaded by the Atlantic, the climate plan warns. One third of the industrial sector could also be impacted, and all the city’s beaches could vanish, it says.